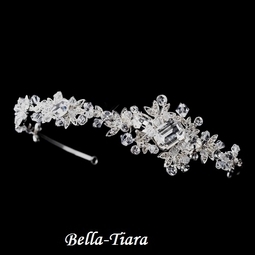 Description: This lovely and beautiful headband features a remarkable arrangement of stunning silver plating, glittering clear rhinestones, dazzling Swarovski crystal beads and fabulous large gemstones. 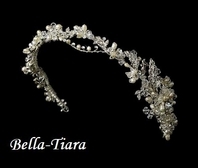 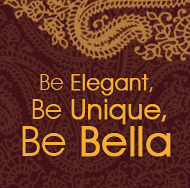 This extraordinary headpiece is a wonderful choice for weddings, proms and homecomings. 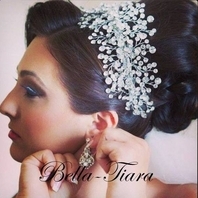 This sparkling antique silver Austrian crystal bridal headpiece features antique silver plating adorned with clear Austrian crystals and large clear rhinestones. 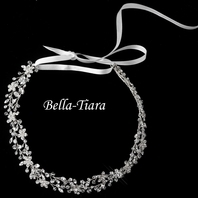 This is perfect for any classic, modern or vintage inspired bride with a white or ivory gown. 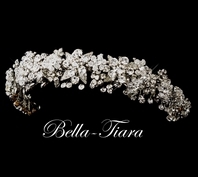 Size: 1.75" tall with design extending 9" on a 13.5" band with end loops .